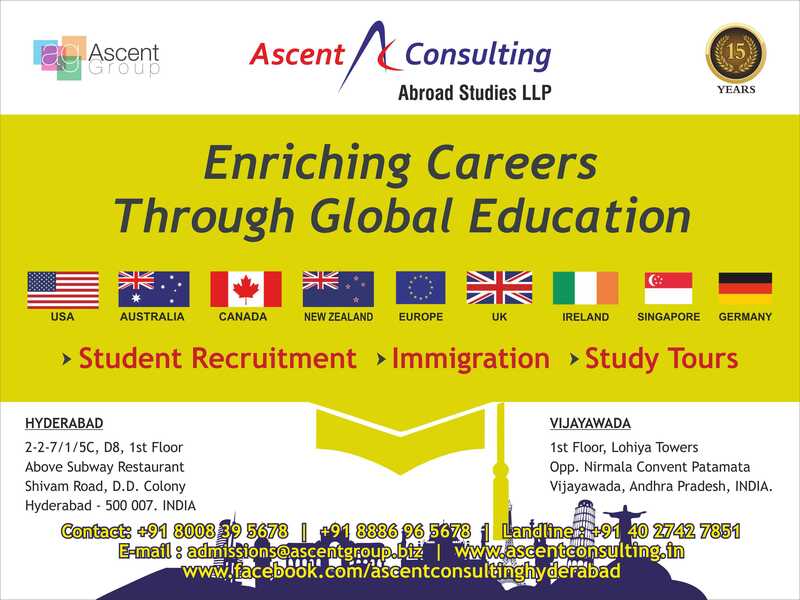 Ascent Consulting Abroad Studies LLP Ascent Consulting ,a vertical of Ascent group was founded in the year 2011 with a intention to give larger and clearer platform to the student community to guide them in their endeavour to pursue their higher education overseas .Ascent offers a unique range of services dedicated to Students at all stages of Overseas Education Consulting. We offer Expert Profile Assessment, University Selection, Admission & Visa Guidance and IELTS Training. Our goal is to enable our students to gain admission to appropriate, accredited universities in United States of America, Australia, Canada, New Zealand, United Kingdom , and Singapore. We process applications for all Universities which suits to the best interest of the student and best suited to his/her profile. An appropriate Institutions selected will be in line with student specification, affordable, with the advantage of career opportunities. We wish our students, staff, our well wishers and their families a very happy Dussehra!!!! Ascent Consulting wishes our students, friends & well wishers a Happy and joyful Holi!! !